So I’m still mad about the FM Spectrum (88-108MHz) noise I get when using a LNA or something else. So I’m still looking for a nice and easy way to filter out these signals. 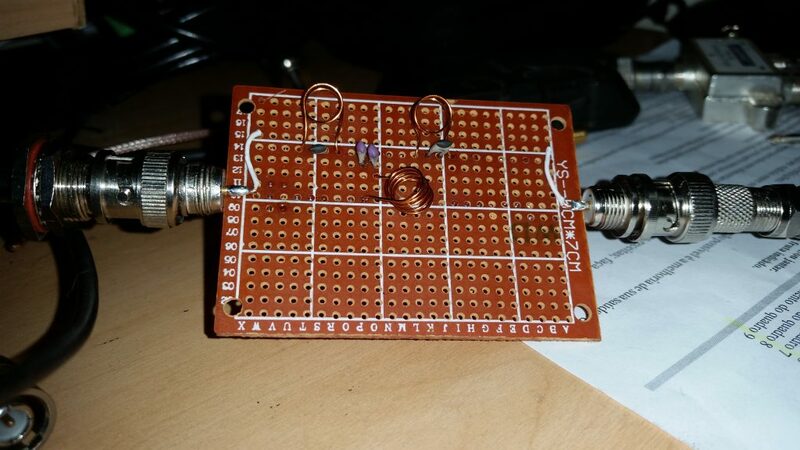 Last time I posted about a TV/FM Diplexer, that works great, but doesn’t attenuate enough the signals. So the solution would be cascading several of them, but I found that is very hard to find one Diplexer or FM Trap filter those days. So I started looking out how to make my own filters. So I reopened Adam’s Website (LNA4ALL) that have a small filter he did for FM Trap and tried (again) to make my own. This time I tryed to find capacitores that actually matches the values that it was calculated. I found here 2 56pF caps and 2 47pF caps. The two 47 is to make in parallel so I would have something arround 23,5pF that is close enough for the center tap 20pF cap. 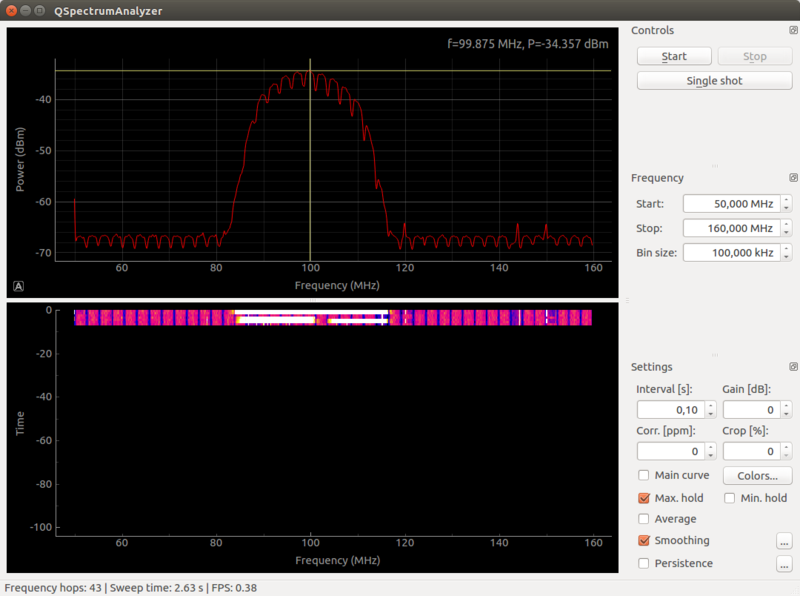 PS: The frequency bar is inverted, who knows why. I got impressed this time, because it really made a big difference. I also played with the coils stretching and compressing to change the center frequency. But as you can see, there are still some very high signals there. This generates a lot of background noise (in HackRF more than RTLSDR because of the IF Filters). So I decided to find a better way to measure my filter response, since I don’t have a wideband noise generator. 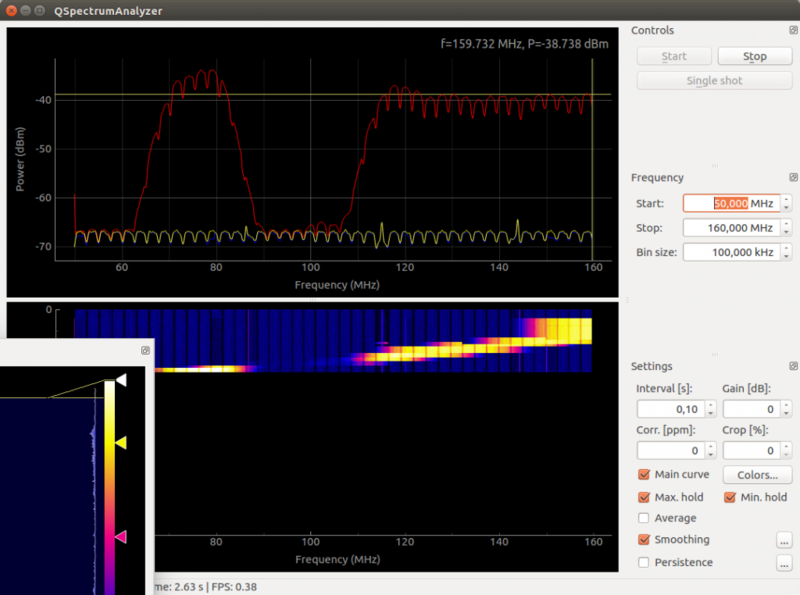 My idea was to go to GNU Radio and put my HackRF to generate a a wideband Noise signal. 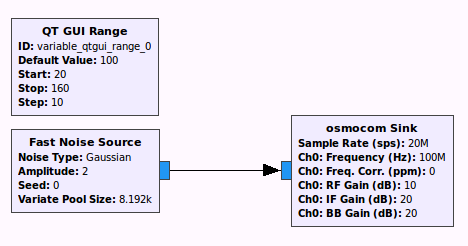 This could easily be done by putting a White Noise Source directly to Osmocom output. I also added a Slider to range the output frequency from 20MHz to 160MHz, so I can do a wide analysis of the filter. So first I wanted to setup a baseline profile of the HackRF Output in the spectrum. 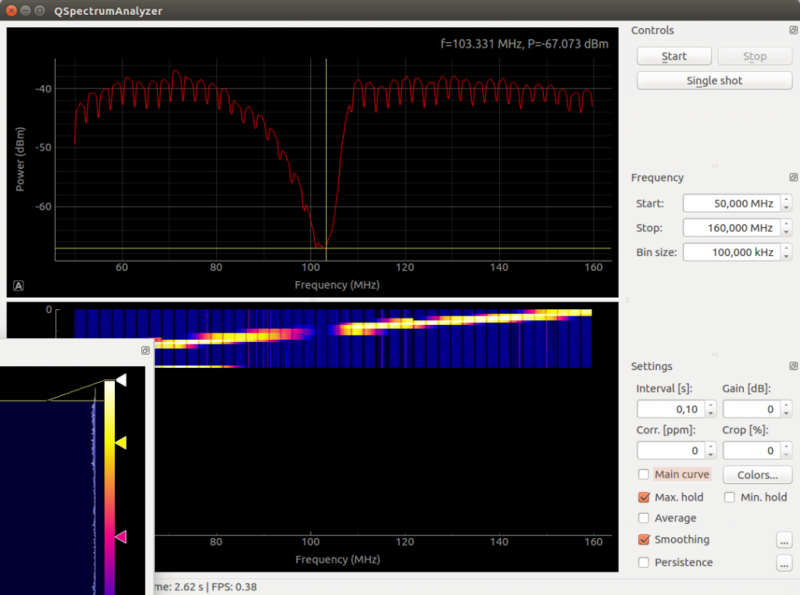 For that I just got the output of HackRF through a 3dB attenuator and to my RTLSDR. 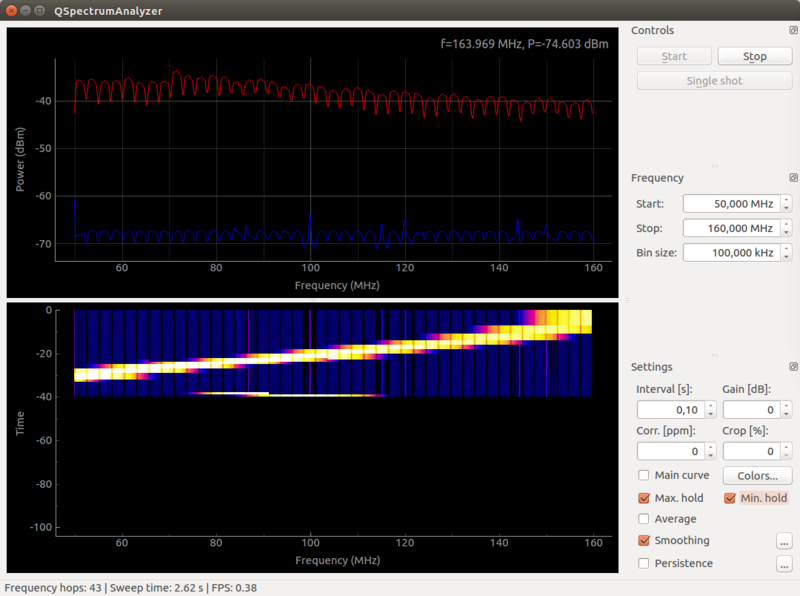 I used QSpectrumAnalyzer as before with the range from 50MHz to 160MHz and 100kHz steps. This time for some weird reason I got some notching at the QSpectrumAnalyzer between the frequency steps. So as you can see, the TV/FM Diplexer have a very wide band stop filtering and completes (-30dB) attenuates the FM Spectrum. So probably this filter is still my best way around. I hope I can make better filters in the future (I ordered a lot of capacitores with a lot of values so I can keep making better filters). This entry was posted in SDR and tagged Adam, FM, FM Trap, FM TV Diplexer, HackRF, LNA4ALL, RTLSDR, SDR on 22 de July de 2016 by racerxdl.